The Philippines. What can I really say about it that hasn't probably been said a million times before. The country is lush and green, and seriously humid. The heat attacks you the second you walk off the plane. Outside the airport, chaos reigns. Taxi drivers jostle for fares, drivers cut each other off, and everywhere the exhaust seems to seep into your skin. Welcome to Manila. A city I spent only a few hours in and honestly, while I want to go back to visit a few things, I think it will destroy my concept of the Philippines. For those that don't know I have been spending my time north of Manila. I started off in Baguio. Baguio is an old US military resort city built in the early 1900's. It is nestled amongst the mountains and is, for a tropical country, surprisingly cool. The high was only about 75-80 degrees and the humidity was almost non-existent. I arrived at the bus terminal and met up with Hana. We headed back to her hotel so I could get a shower and wash the airport, airplane, and bus ride off of me. After that we grabbed dinner at Camp John Hay (old US military base). We spent the next day exploring Baguio and viewing a couple of its sites. Baguio is a crowded polluted version of an American alpine town. Take Big Bear, but give it a population of 200,000. Add on top of this countless exhaust belching vehicles and you have an idea of what this city is like. The biggest shame is that this city is very pretty, and surrounded by beautiful nature, however the air is really polluted. We left the next day for Banuae and the Ilfuago rice terraces. 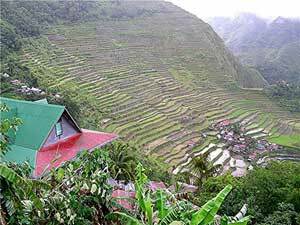 These small towns in the middle of the Cordillera mountains contain some of the worlds most striking rice terraces. They were carved from hand about 2000 years ago, and are still being used today. Banuae is a small town surrounded by terraces. It was however, a 10 hour bus ride (I thought it was going to be 5 or 6). We arrived there and after strolling the two main streets found our place to stay for the night. The town is a small mountain town and it is surrounded by gorgeous rice terraces. The next day we chartered a jeepney and took a 1 1/2 hour 16 kilometer (10 miles) ride to the Batad saddle. From here it was an hour hike down the mountain to see Batad. Batad is quite possibly the 8th wonder of the ancient world. It is a small town, accessible only by hiking or extreme mountain biking. The town is surrounded by an amphitheater of terraces. It was a stunning sight, and the only thing that stopped us from spending more time there was the 10 hour bus ride we had back to Baguio that night. I have already decided that the next time I find myself north of Manila, I am headed back here to do this place right. I think 5 or 6 nights, with no plans and tons of trekking will do a body and soul good. After waking up in Baguio again we hopped a bus up to Vigan. Vigan is an excellent example of the Spanish colonial style that used to exist everywhere in the Philippines. Unfortunately most of it was destroyed by either the Japanese or the Americans during World War Two. It turns out that carpet bombing doesn't do a lot of nice things to historic sites. Somehow, though, Vigan was spared. 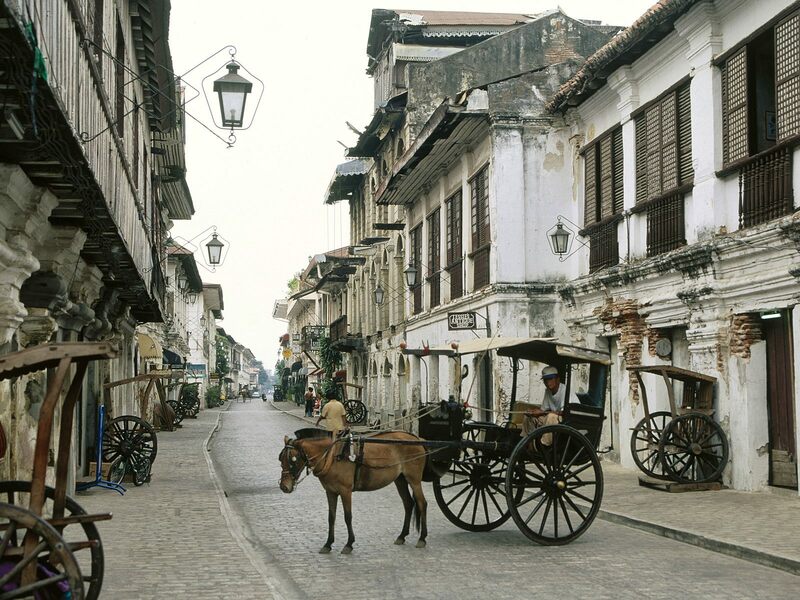 To that extent the old Mestizo district is lined with Spanish era colonial style homes. They are crumbling and ill maintained, but that just adds to the experience. Here we visited a traditional weaving factory, a clay pot factory, a zoo (I touched a tiger), and a garden. The city is gorgeous, and everywhere I go I keep being surprised by just how pretty it is and could be if it was immaculately maintained. I can only imagine that this is what old Manila used to look like. Tomorrow we head up to the beach at Pagudpud to relax for three days and then head back to Korea. I hope you still have all your fingers after petting that large kitty cat! !